Im Studio bei: “The Flame”. 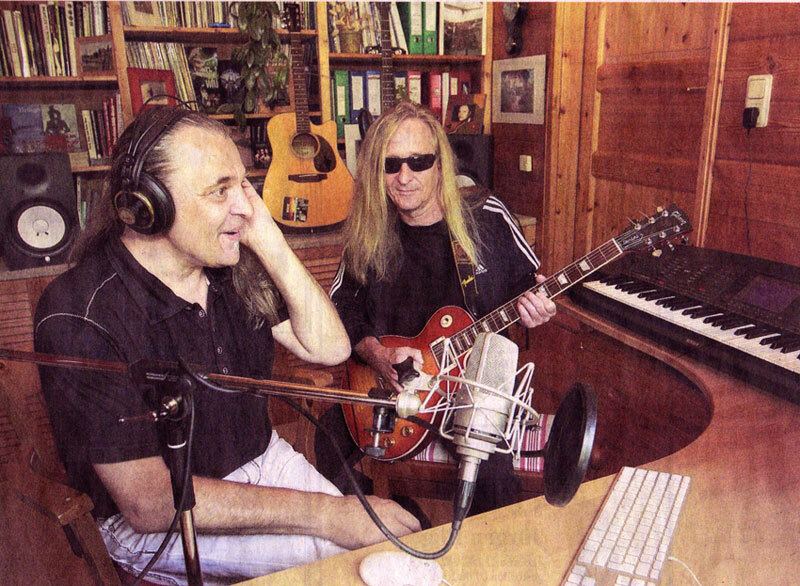 Wenn Frank Flemming und Peter Viertel gemeinsam Musik machen, dann stehen sie nicht auf der Bühne, sondern meistens im Studio. Die Hobbymusiker haben sich als Musikprojekt “The Flame” dem Einspielen eigener Titel verschrieben. Schwarzenberg/Thalheim (fp). Der sparsam eingerichtete Raum im Wohnhaus von Frank Flemming ist schlicht, aber genau das, was “The Flame” für seine Passion braucht. Ein älteres Klavier der Marke Zimmermann, Keyboards, Mikrofon, Kopfhörer und ein paar Verstärker. Mehr steht hier normalerweise nicht. Nur wenn Peter Viertel vorbeikommt, wird es etwas voller im Studio, denn der Thalheimer bringt noch einiges Equipment mit. Thaiheim / Schwarzenberg. 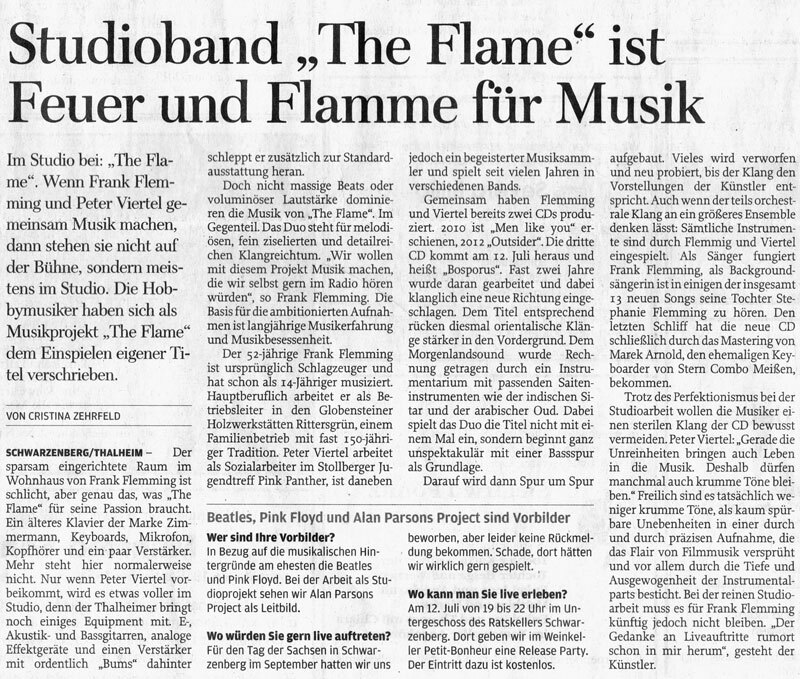 “The Flame” – The name of the band may sound unusual to german ears, but the band´s founder, Frank Flemming has had the nickname “Flamme” since an early age and wanted his band to reflect this. Flamme has been able to express his musical talent by singing and recording all voice tracks, keyboards and percussion. He released his first album “In The Morning” in 2009. He writes and sings all lyrics in english, while the musical styles are widely varied. From fine pop to reggae to melancholic ballads; the peppy “Men in Black Limousines” even goes as far as strong rock. Variation in the music style is guaranteed through the fine integration and inspiration brought by both members of the band working closely for many years, leading to a harmonic set of songs which carry the hallmarks of both band members. Peter Viertel from Thaiheim/ Germany, on board for the first time on the new album, is responsible for the new direction on the new album. The pair played for a short time in the band “Seitensprung”/ Germany (now named “Floyd Dream”) over 20 years ago and have stayed in contact and finally teamed up again for this new project. While the first stages of production were performed without a guitar track, Peter Viertel was able to bring his musical experience well into the mix, influencing the total effect of the album, filling it out richly with his inimitable licks and smooth melodies (he had previously played in the band “Dice” and in the Pink Floyd tribute band “Floyd Dream”). The song texts are mainly every day stories of relationships, life crises and personal points of view. At the moment, the pair are working on their third album “Outsider”, which is projected to be released in 2011. Here the musical direction has moved more toward progressive rock on some of the longer tracks. Peter Viertel would find it more interesting if the albums could be released on vynil, but the band members know that, when all is said and done, the only important thing – is the MUSIC.